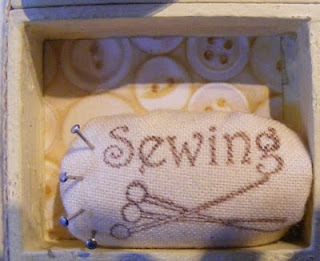 Well here is project three from this month's selection of a little decorated box, inspired by Isa Norris. I was really looking forward to making this project as I love working on miniature projects. I have been a bit naughty as I wanted to work with two boxes. I decided to mount the boxes onto a little wooden triptych screen that I had been itching to use for some time, so I have been working in and out of the box like Jo. I decided to make a project with a sewing theme when I saw a set of needlework themed stamps made by Mirkwood Designs on E Bay! It took three attempts by my OH staying up until the early hours to successfully bid for this set from a seller in the US! 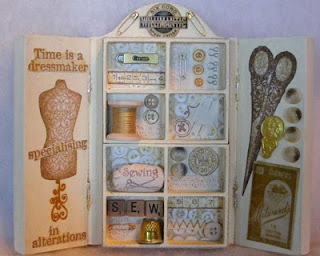 I have wanted to make a needlework themed project for ages since I saw the gorgeous Grandma's Sewing Book project by Helen Chilton in the August 2008 issue of Craft Stamper. So this project was actually inspired by two designers. I painted my boxes and screen various shades of mushroom, pale yellow and finally cream until I was happy with the colour. The intial idea was to cover the screen with dressmakers' pattern tissue, which I did, but the tissue didn't really go transparent to show the colour through and looked a muddy colour, so I sanded it back and repainted it again!! I used some twill measuring tape to edge the boxes that I bought some time ago from The Stamp Connection stand at Alexandra Palace. The little boxes are lined with Life's Journey paper by K & Co. The Time's is a Dressmaker stamp on the left hand panel is from Paper Artsy, as is the squiggle I used as the stand for the dummy. Originally I planned to use the words to top the project, but they were too big, but then I got the idea to use the dummy from this card on Suzanne Czosek's blog that I was browsing on the other day. I didn't realise at the time that Suzz is a blogging pal of Lesley. Thanks for the inspiration Suzz! If you haven't visited Suzz's blog, it is full of inspiration! I got the template for the dummy on the Stampington website, reduced it to the right size on the photocopier and cut it out of Webster's Pages paper and coloured the edge with Frayed Burlap Distress Ink. I stamped the stamp onto tissue paper and stuck it on with gel medium. The large scissors on the right hand panel are from the Mirkwood plate, the needle packet and the cotton label on the top are from a pack of rub ons. 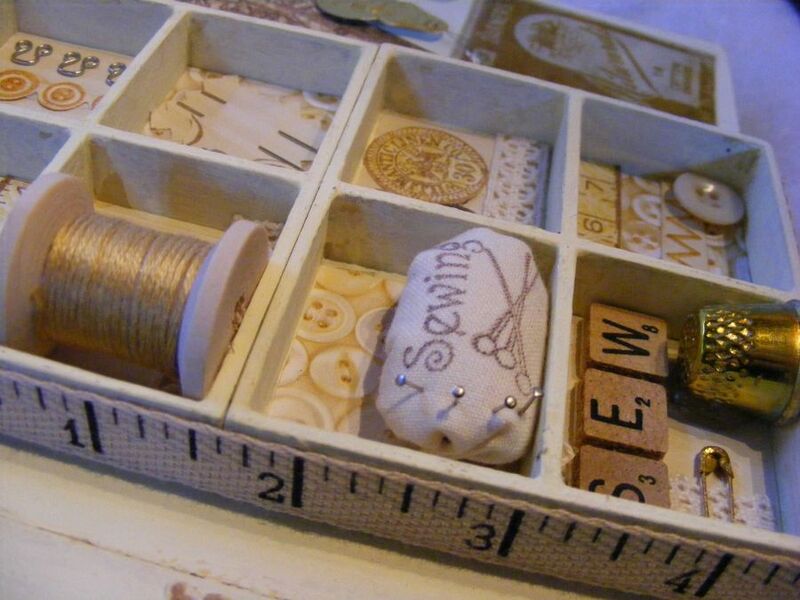 I decorated inside the compartments with cream cotton lace, various stamps from the Mirkwood set, The ruler and some of the buttons are Lost Coast stamps from Happy Daze. The little cotton reel is another purchase from the Stamp Connection, with gold coloured embroidery thread added. I also used the button and zig zag stitched design are narrow Cuttlebug folders from the Just my Type set. I added some real needles, a safety pin and some eyes. I wanted to include a little pin cushion, so I stamped onto some calico fabric and gathered it into a little pin cushion, adding some tiny lace making pins. I added some more stamping, a little thimble that I coloured with Butterscotch alchol ink, which I used on all the slivery metal elements to make them golden coloured to match the rest of the colour scheme. I finally added some little wooden scrabble tiles and some vintage buttons that I think may have come from my grandmother's sewing box. I really enjoyed making this project, I want to thank Isa for the original inspiration and for her generosity in sharing her skills and knowledge with us crafters and thanks to Judith for choosing this project for us to tackle. Now this is how to do miniature! I think this just looks good enough to eat and makes me think of the lovely tiny things I used to love to explore as a child. It's a little box of treasures. There's so much I like about it but if I had to pick one favourite bit it would be the pin cushion. But I'm curious to know if you decorated the other side of the triptych, Elaine. Possibly not as it is not designed to close with the box inside. I'm just being nosey really as I bought one too and have yet to use it. Fantastic project. Just perfect in fact. very clever and beautifully put together. This is absolutely gorgeous and as I'm a keen stitcher it was great to see the theme you chose. Brilliant. Wow Elaine, it is so obvious you were in your element with this one (unlike moi!). The whole piece is a stunner. I love the colours, the theme, all the tiny embellishments (the pin cushion and cotton reel are my faves)and the stamped images. 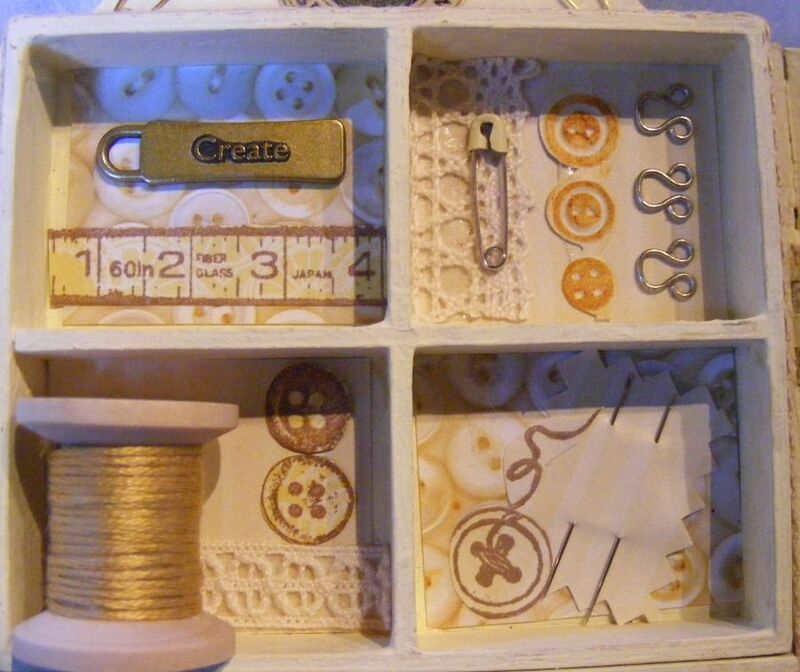 Placing the boxes on the triptych is a great idea and it looks like a proper little sewing cupboard to me. I love it! This is a beautiful piece Elaine, it hits the spot for me, as I was brought up in a sewing family, so it brings back happy childhood memories for me of rummaging through button boxes, and sewing ephemera. My Aunt was a professional seamstress, and my Mum taught me to sew at an early age, and I made many of Megan's posh little dresses. I have a little gold thimble just like that one! Lovely project Elaine. Next thing will be a dolls house! Like the pin cushion. Really stunning!! 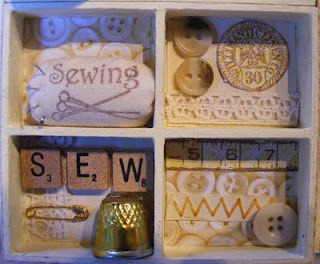 love the sewing theme!